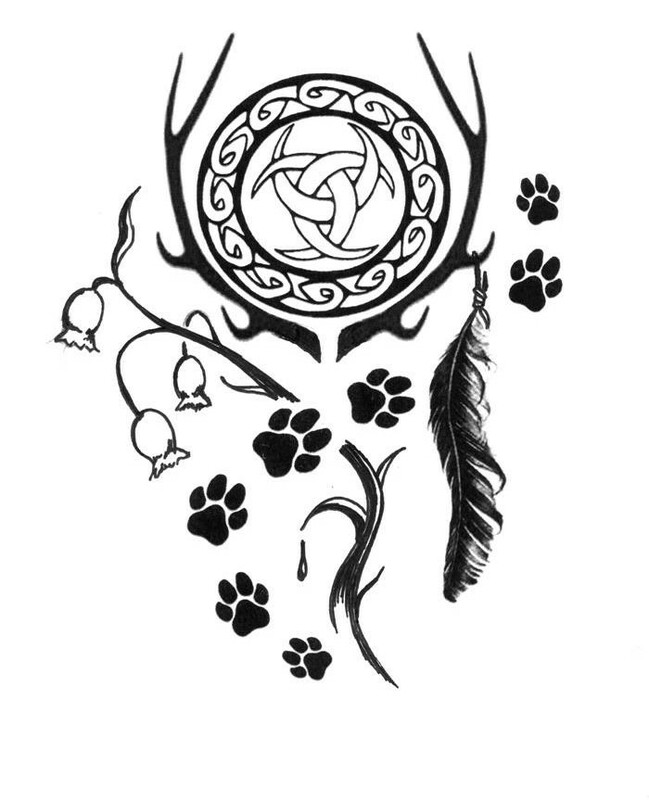 Thanks to the help of a great friend.. Miss N here is my newest Tattoo Design, its a memory piece for my beloved Hounds and Purrpots that have crossed over, gone but Never! forgotten. There are so many little details to this that all have meaning to me.. the pawprints in kitty, small hound and big old Lily paws, the connection to the north (Raven Feather) to the Bell’s for my beloved Bell To the Celtic tie in, to the never ending circle of life (something that I will now have in three tattoo’s) to the Goddess Freyja’s Symbol to the tree of life, to the tear, water, always moving, always flowing.. to the antlers that represent the Stag, the male energy..
How my friend was able to take the jumble and collection of this and that I pulled and wanted and turn it into this beautiful to my eye and heart piece , I will never know but I lift my glass to you. It will be a honor to have it grace my shoulder for hopefully many years to come.